It’ll be another busy weekend on the recruiting front in South Bend as Notre Dame hosts several top 2020 prospects, including the first official visits of the cycle. 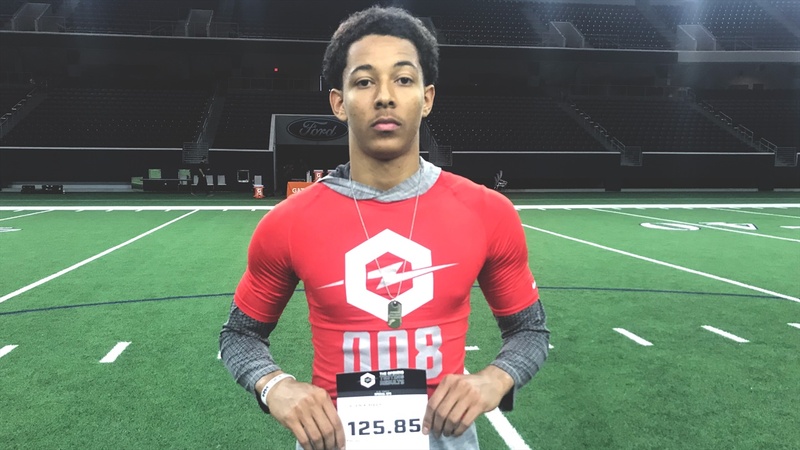 Jalen Kimber‍ (pictured above) is one of the most-coveted targets coming in for a multi-day visit, but this actually won’t be an official visit for the 2020 Texas cornerback. If all goes well in South Bend, he’ll likely be back for an official in the future, but for now, Kimber is taking everything in. He did a flurry of visits last week, checking out Georgia, Georgia Tech, South Carolina, Clemson, Auburn and Alabama in three days. 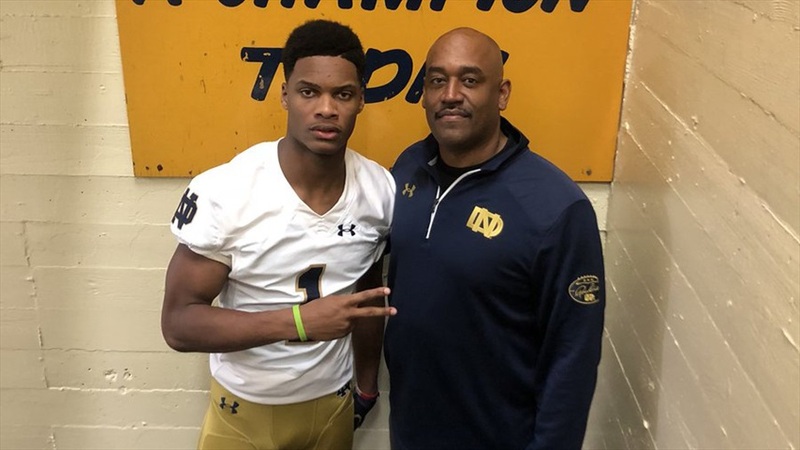 He’ll have more time to see what Notre Dame is all about this weekend and the comfort factor will be “critically important,” according to one source. Kimber has already had extensive communication with multiple members of the Notre Dame staff, so none of that will be new to him. The Irish have been listed among the top schools for Kimber along with Texas and Alabama, but as evidenced by his travel schedule, he’s still open to other schools. He’s expected to take a visit to Florida next weekend and then look at potential official visits from there. He could use all five visits. He could use just three and if he knows where he belongs, he could take just one. But with so many top options, Kimber doesn’t need to be in a rush to make a decision. Kimber isn’t the only top Texas cornerback who will be in town this weekend as Ryan Watts‍ will be in on an official visit. Watts has decided to use his official visits to get to out-of-state schools. He will be at Oklahoma next week and Arkansas next month. The Little Elm High School standout is also considering officials to Miami and Cal. Meanwhile, Texas, Texas A&M and Baylor are all still in play. Notre Dame assistant Brian Polian has made a strong impression and this weekend’s visit will be about seeing how comfortable he’d be in South Bend. He plans on making a commitment this summer. Notre Dame has been trending in a positive direction with Jordan Johnson‍ for a while now and the Missouri wide receiver will be back in town for his official this weekend. The St. Louis native was in South Bend back in January, when he got a good chance to see what daily life is like as a student-athlete at Notre Dame. He was also able to reconnect with fellow St. Louis native and early enrollee Kyren Williams. Arkansas is one school that had his attention early on. As his recruitment has gone national, Texas, Texas A&M and USC have made impressions along with in-state Missouri. Johnson is scheduled to make his announcement on his mother’s birthday, July 28th. A pair of top 2020 offensive linemen will be in for officials in Virginia’s Jimmy Christ‍ and Colorado’s Andrew Gentry‍. Gentry was in South Bend back in December and by the time he left, he knew he’d be back. Gentry told Irish Sports Daily he “really, really fell in love” with Notre Dame during his first visit. He has a strong relationship with offensive line coach Jeff Quinn and is one prospect who is serious when he talks about academics. He’s in the process of trying to narrow his list and set other official visits. He’d like to commit as soon as he can, but won’t do so until he’s sure. Colorado, UCLA, BYU, Michigan and Alabama are among the other top contenders. Christ may have already narrowed his list, although he hasn’t done so officially. He could decide to look at other schools, but as of now, he’s focused on the three officials he has scheduled – Notre Dame, Oklahoma and Virginia. Christ’s last visit to South Bend was for a game in the 2017 season and is excited about getting back. He too has formed a strong relationship with Quinn along with offensive coordinator Chip Long. He’ll be at Oklahoma next week and will be at Virginia two weeks after that. Christ comes from an athletic family with three brothers having played college football, including one each at Virginia and Virginia Tech. His father played at Navy, he has an older sister who is committed to play Division-I basketball and a younger sister who is already a top prospect. He doesn’t feel any pressure to stay close to home or follow in anybody’s footsteps. For Braiden McGregor‍ and Rylie Mills‍, it’s not going to be about exposing them to Notre Dame’s bells and whistles. Both want to look at Notre Dame’s academics and spend more time with the current members of the team to see if they truly fit into the program. I’d imagine each family will also have questions for the Notre Dame staff as both could be making their last trip to South Bend before they make a decision. N‍otre Dame will have a wild card in its back pocket as 2020 defensive line commit Aidan Keanaaina‍ will be in South Bend for his official visit and he has hit it off with both McGregor and Mills already. Keanaaina has a personality very similar to both uncommitted prospects, so it will likely be a very positive aspect of the visit for McGregor and Mills.